Planting wild flower seed is a wonderful way to make a field or garden spot look more natural and to fill it with color without a lot of work. Wild flowers grow pretty well on their own when you put them in the right location. They can give you a lot of pleasure looking at them in the yard as well as using them for cut flowers. The first thing you need to know before you start planting wild flower seed is where in your yard wild flowers will be successful. Wild flowers are relatively hardy and will grow in places that other plants will not, but that doesn't mean all wild flowers grow equally well everywhere. Most wild flowers like a full eight hours of sunlight a day. There are wild flower seed mixes that claim to be for shadier spots, but your flowers will be much more successful if they have sufficient sun. Wild flower seeds, like any other seeds, need adequate water while the seeds are germinating. If the site doesn't get a lot of rain or isn't well-drained, you need to be able to provide water for the seeds as they are getting established. Water and light are the main considerations for planting wild flower seed. It's also important to look at what the site currently looks like before deciding if wild flowers will be successful there. If little to nothing is growing in the spot right now, and if everything you've ever planted there has died, odds are good your wild flowers won't fare much better. On the other hand, if you have a spot where grass or other plants are doing well that you would like to convert into a wild flower garden, you should have success. The most important thing you can do to make a site successful for wild flowers is to remove all existing plants and weeds in the area where you would like your wild flower garden to be. For small gardens, the easiest way to do this is to cover the area with a layer of newspaper and a tarp. Leave it alone for a few months so the plants below will die. You then will just have to clean up the site and it will be ready to plant. If you're trying to get rid of grass, a sod cutter can be a big help. These devices can be rented from many machinery rental stores. Remove the top three inches of lawn before planting wild flowers. It's also a good idea to till the soil about one inch deep to break up any clumps of dirt. Tilling deeper will only encourage the growth of more weeds. Different wild flowers do well in different kinds of soil. Black-Eyed Susans, for instance, prefer a moist, but not soggy, soil and full sun, while Jack in the Pulpit can be killed by excess moisture. Make sure you really understand your site and the kind of plants that will work best for it before you buy or plant seed. Many wild flower seed supply companies offer different wild flower mixes that are well-suited to particular conditions. 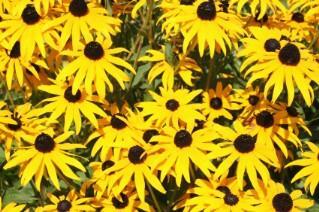 You should be able to easily find flowers that will do well in your yard. You can also choose your own mix of flowers to plant. While planning your wild flower garden, you might want to consider adding grasses that can serve as a weed blocker. The grasses won't compete with the flowers because grass tends to have much shallower roots that the flowers do. Once your site has been prepared, it's time to plant your wild flower seed. In most planting zones, planting in the early spring is recommended. If you live in zone 7 or higher, your seeds can be planted either in the early spring or late fall. Planting in the fall may result in some plants dying if they experience extreme cold temperatures, so keep that in mind. The best way to plant seeds is to scatter them across the area that you want to plant. If you are covering a very large area, it's a good idea to mix the seeds with an inert material such as peat moss or sawdust. Wet the material down slightly so the seeds will stick to it and scatter it evenly across the planting area. Tamp the seeds down gently by walking over the area or using a roller. The seeds don't need to be deep, and some seeds need light to germinate, so follow the directions for planting that came with your seeds carefully. Carefully cover the planting area with a light mulch, such as hay, to help retain water. Water the seeds well and regularly. Be patient, as some seeds take weeks to germinate.